When someone damages Fa Zheng, they must give him a heart card from their hand. If they do not, they receive lose one health. When another character heals Fa Zheng, they draw a card. 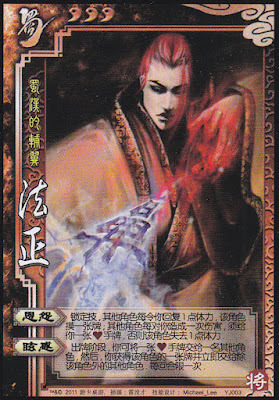 Once during his turn, Fa Zheng can give another character one heart from his hand. Then, he can take any of their cards and give it to any character. Note that "Grudge" is enforced. Fa Zheng cannot elect to not activate this power when another character hurts or heals him. "Grudge" is a 'per-instance' retaliatory power. It does not matter if a character deals one, two, or even three units of damage to Fa Zheng - they must still give Fa Zheng one heart card or receive one unit of negligence damage. If someone kills Fa Zheng, they do not have to worry about "Grudge" until Fa Zheng is saved. The character that saves Fa Zheng first gets to draw a card, then the character that brought him to the brink of death must give Fa Zheng a heart. When Fa Zheng gives another character a heart for "Dazzle," the recipient must shuffle the heart into their hand. If Fa Zheng chooses to take a hand card, there is a chance that he will get the original heart card that he gave this character. When Fa Zheng uses "Dazzle" to take a card from another character, he cannot give the stolen card back to the original character. He must either keep it or give it to a third party. "Grudge" is an excellent deterrent. It is unlikely that another character will attack you unless they have a heart that they are willing to part with or an extra Peach. "Dazzle" is a very good power because it has multiple uses. It can be used to steal a card from any character and give it to any character, or it can be used to give a character a useful card, like a Peach or Dodge. "Grudge" and "Dazzle" are two powers that work very well with each other, as "Grudge" can provide heart cards for "Dazzle." While "Grudge" is a good deterrent, most characters will wait to hurt Fa Zheng until they have a heart they are willing to part with. While many heart cards are useful (like Draw 2 and Peach), it is possible that they will give you a less-useful heart card, such as Harvest and Lightning. "Grudge" is enforced, so if an ally damages Fa Zheng, they must give him a heart card or suffer negligence damage. As previously mentioned, it is possible that Fa Zheng might get the same heart that he gave the character to activate "Dazzle" if he elects to take a hand card. Sun Shang Xiang - Sun Shang Xiang is quite possibly Fa Zheng's perfect match. Fa Zheng can use "Dazzle" to take a piece of equipment from another character and give it to Sun Shang Xiang or give Sun Shang Xiang a heart and take a piece of equipment to activate "Armed Consorts." Additionally, "Grudge" allows Sun Shang Xiang to draw a card after she uses "Marriage" one him. This helps mitigate the expensive cost of using this power. Hua Tuo - Hua Tuo seems to match up pretty well with Fa Zheng. Fa Zheng can give Hua Tuo a heart and take a black card, giving Hua Tuo another card for "First Aid" outside of his turn. Additionally, Hua Tuo can heal Fa Zheng with either of his powers and draw an additional card, making these powers essentially free. Xiao Qiao - Xiao Qiao can pass damage to Fa Zheng so the source experiences "Grudge," while Fa Zheng gets to draw some cards. Additionally, Fa Zheng can give Xiao Qiao heart cards for "Fantasy." Zhang Chun Hua - Zhang Chun Hua's "Unfeeling" prevents Fa Zheng from targeting her with "Grudge," as all damage that is caused by her is considered to be negligence damage. This robs Fa Zheng of his only defensive ability against her. Dong Zhou/Zhang Jiao - Dong Zhou can use "Wine" frequently and easily. This allows him to deal two units of damage to Fa Zheng easily, while he only has to give Fa Zheng one heart or take one unit of negligence damage. Zhang Jiao can easily deal two units of damage to Fa Zheng with "Lightning Strike." Jia Xu - When Jia Xu kills Fa Zheng, Fa Zheng must have a Peach to save himself or else he will die. This is useful for Jia Xu, as it is less likely for Fa Zheng to be saved for "Grudge" to go into effect against him. Also, "Upheaval" can be used to cause Jia Xu to become damaged from negligence and/or from another character. Diao Chan/Xun Yu - These characters are very good counters for Fa Zheng because they can force a teammate to hurt Fa Zheng. Since "Grudge" is enforced, Fa Zheng cannot choose to not activate this power against his ally. King Interestingly enough, Fa Zheng is sometimes chosen as king on San Guo Sha Online. He usually fairs pretty well, although he is probably not a better king choice than the natural king choices. Loyalist Fa Zheng is a competent loyalist. He can use "Dazzle" to steal cards from rebels and give useful cards to the king. However, the king must be careful not to damage Fa Zheng. Rebel Fa Zheng is an excellent rebel. The king and loyalists must kill him, but "Grudge" will be activated in the processes. Much like the loyalist scenario, however, the fellow rebels must be careful not to hurt Fa Zheng. Spy Fa Zheng is an excellent spy choice. Once it becomes apparent that he is the spy, nobody will pursue trying to damage him. This will allow him to live for a long time. With "Dazzle," it is easy to support the losing team while hindering the winning team in an effort to keep the game balanced. Fa Zheng is a very good character. He is a good match for most roles and he works well on a team or independently. However, it is important to realize that Fa Zheng is not perfect. In team situations, the other teammates might hold back from using Barbarians and Hail of Arrows. Also, as mentioned previously, enemies can store up less-useful heart cards to use for "Grudge." Despite these weaknesses, Fa Zheng is a complete joy to use and a pain to fight.